Lots of interesting articles for the prepping community in this week’s Friday Five from PreppingToSurvive. Here are the top five: Congress wants FEMA to plan for mass casualties, 15 do-it-yourself natural remedies, 4 in 10 Americans have less than $500 in savings, the FBI goes hi-tech in its monitoring, and a ham radio FAQ. Big Pharma and the the FDA would have us believe that only high-priced and patented drugs can take away the things that ail you. If you’ve got a problem, they’ve got a prescription. However, as this ReadyStore article points out, there are lots of traditional and natural ways to treat common ailments. From The Ready Store. A recent survey of over 1,000 people found that 4 in 10 Americans have less that $500 readily available in case of an emergency. During these tough economic times when the U.S. is precariously teetering on the of recovery and total collapse, 40% of Americans have nothing to fall back on in times of need. Many of those surveyed had large homes and even 401(k) plans. 54% of the respondents indicated that they had no saving plan at all. From CBS Philly. While much of America is watching the Presidential election unfold (or perhaps American Idol), the House of Representatives have quietly introduced a new resolution, H.R 6566, which, if passed, would require the Federal Emergency Management Agency (FEMA) to begin “mass fatality planning.” The resolution also bestows unprecedented powers to the FEMA director that will extend control down to the local communities. From Natural News. The days of using a couple of wires to tap into the phone line of a “person of interest” are long gone. Replacing them are hi-tech surveillance systems designed to recognize and monitor people anytime, anywhere. The FBI’s $1 Billion Next Generation Identification (NGI) system combines everything imaginable, from biometrics to mug shots to facial recognition. Combined with GPS cellphone records, you can be found at anytime. From PCWorld. Long time readers know that I advocate learning learn to use an amateur radio as part of preparing for the worst while hoping for the best. Like many prepping activities, even if you never need the skill or technology in an emergency it’s still a fun hobby. Not sure where to begin? Off Grid Survival posted a short Ham Radio FAQ to help get you started. 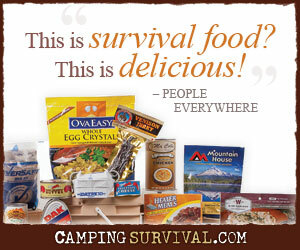 From Off Grid Survival.